New research has shown the popularity of co-working spaces and e-commerce is influencing Bangkok's commercial property market. Photo by Hanny Naibaho on Unsplash. A snapshot of Bangkok's night life. New data from CBRE has highlighted the trends impacting Bangkok's commercial property market. The international consultancy firm conducted surveys within the city's office market and retail industry to provide an outlook for each sector. More than 850,000 square metres of new office space under construction which is due for completion between Q4 2018 and Q4 2022. More than 1.7 million sqm of office space still being planned. As of Q3 2018, there was about 1.4 million sqm of under construction or planned space in Bangkok. By the end of 2018, there will be 46,800 hotel keys in the Bangkok downtown market, representing an increasing of 4.6 per cent from 2017. CBRE Research forecasts that there will be 11,000 more keys completed by 2022. 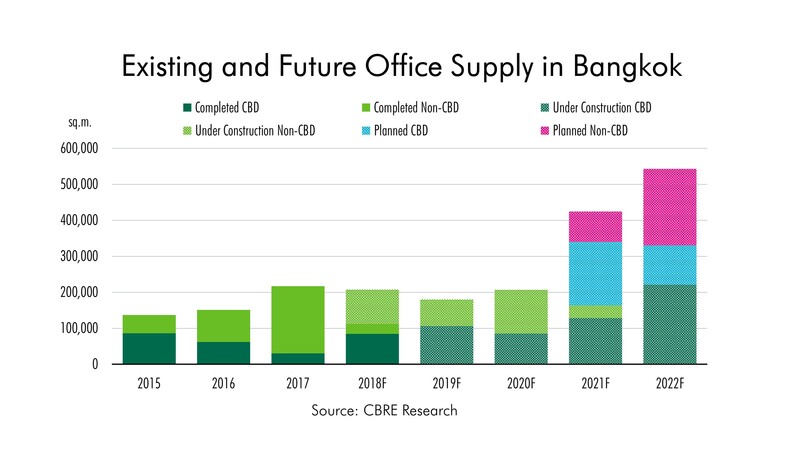 According to CBRE, the Bangkok office market remains strong with steady demand. A net office take up of 140,000 square metres for the first nine months of 2018 is expected to be nearly 200,000 by the end of the year. A survey found there was more than 850,000 square metres of new office space currently under construction in Bangkok, with more than half of it confined to the CBD. A further 1.7 million square metres is in the planning stages, with CBRE expecting construction to start on more projects in 2019. CBRE Thailand Head of Advisory and Transaction Services, Nithpat Tongpun, said rents would rise at a slower rate until 2022 when new supply would exceed demand. New sources of demand include co-working spaces, with 44,000 square metres of space leased in the past 12 months. Mr Tongpun said co-working spaces will compete more directly with traditional offices in the future and may reduce net take up. The Thai retail industry is under "intense" pressure from new retail supply and e-commerce, according to CBRE. The firm's Head of Advisory and Transaction Services for the retail sector, Jariya Thumtrongkitkul, said malls must "innovate or die". "As a growing number of consumers prefer to use both online and offline channels, bricks-and-mortar retailers are being forced to adopt omni-channel strategies to integrate their physical stores and online shopping in order to create 'experiential retail'," she said. According to JD Central, the e-commerce market currently accounts for 3 per cent of all retail sales in Thailand, which is expected to increase to 10 per cent within five years. While Thailand's tourism industry experienced a dip in the number of Chinese inbound visitors following the July's Phuket boat incident, CBRE data showed no decline in the number of international tourists disembarking from Don Mueng Airport and Suvannabhumi International Airport from last year, indicating Bangkok was less affected by the tragedy. According to STR Global, the average hotel occupancy in downtown Bangkok has remained high since the beginning of the year and is currently about 80 per cent. Research from CBRE predicts 11,000 more keys will be created for the Bangkok downtown market by 2022, based on announced developments. CBRE Thailand Head of Capital Markets, Atakawee Choosang, predicted a strong end to the year for the market. "Considering Bangkok was named top overnight market tourist destination in the world by the Mastercard's 2018 Global Destination Cities Index, we optimistically expect to see healthy performance in the high-season of Q4 2018, driven by the end of year Christmas and New Year holiday," he said. Did your city make the top 10 in the Prime Global Cities Index Q3 2018? How will mortgage restrictions affect the Bangkok residential market?